A serger is a specially designed sewing machine that is used primarily to make professional looking finished edges, particularly on stretchy or woven apparel. Using a serger (or overlock machine) is the best way to make your seams like a pro. It is fast and saves the sewer a lot of time because with just one motion you can finish an edge, sew a seam, and trim off any excess fabric! You can also gather, make rolled hems, and even do cover stitches if you're so inclined. Stretchy fabric and a serger are a match made in heaven. Imagine never popping a seam again! In addition, a serger provides the ability to do many specialized stitches. But is it right for you? Do you really need one? And if so, which serger is right for you? How do you choose? How much does it cost? 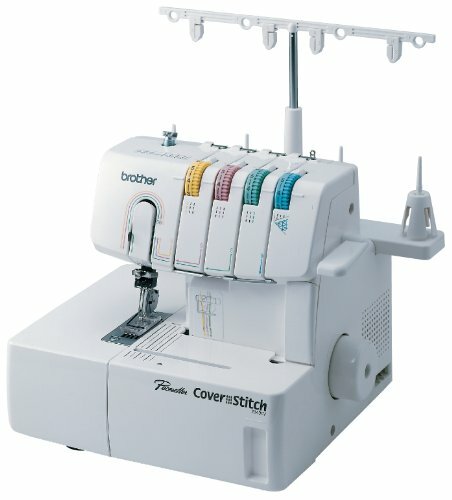 Brother 1034D 3/4 Thread Serger with Differential Feed: best overall serger machine. SINGER 14CG754 ProFinish Serger Sewing Machine: best affordable serger for beginners. Enter the serger. You might not need a serger if you are happy with the overlock stitch on your sewing machine that manufactures neatly finished seams. What you get with a serger is added functionality. A serger will handle thicker threads for decorative stitching, and it can cut fabric, an important plus feature that traditional sewing machines don't have. This makes the serger a perfect choice for sewing knits, like the seams in a t-shirt or other fitted knit shirt. Most sergers come with differential feeds which will allow the sewer to create ruffles on lightweight fabrics or even waved edges. If you want to amp up your sewing projects, there isn't a better choice than a serger, that can create tight overlock stitches, ravel-free seams, and gorgeous decorative edges that will take your handiwork to a brand new level. If you're looking for a good serger home machine, expect to pay between about $200 and $600. The editor's choice, which is revealed directly below, comes in at the low end of the scale at about $225-250. Your cost will depend on the amount of special features, differential feed, color-coded or auto threading, tension adjusters, and extra attachments included. Several of the finest machines reviewed here today fall in the $600 to $800 price range. Why You Should Buy It: This sewing machine is the ultimate in sergers and finishes raw edges quickly and beautifully. Why You Should Buy It: This quiet, budget-friendly serger comes already threaded with 4 different colored threads and is simple to change from single to double needle. 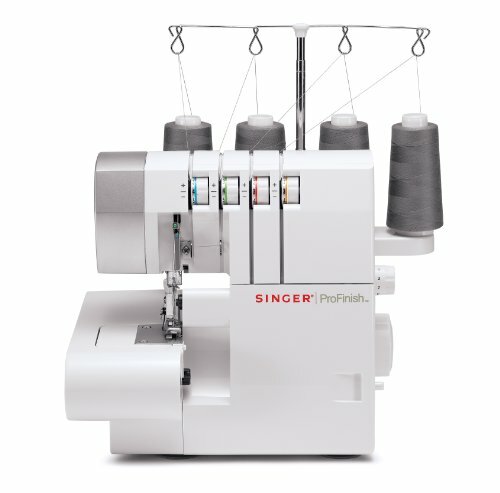 We rated the Singer 14CG754 ProFinish Serger Sewing Machine 4.5 out of 5 stars and is a 2-3-or-4 thread-combination differential feed serger which can sew 1,300 stitches per minute, while at the same time providing more stitch variety and less puckering and stretching. This reasonably priced sewing machine sews serge, standard, and 4 built-in rolled hems (perfect for lightweight fabrics), and has an integrated heavy-duty movable upper knife system, an extra-high presser foot lift, a removable free arm that's perfect for cuffs, armholes, and other projects, and a built-in sewing light. 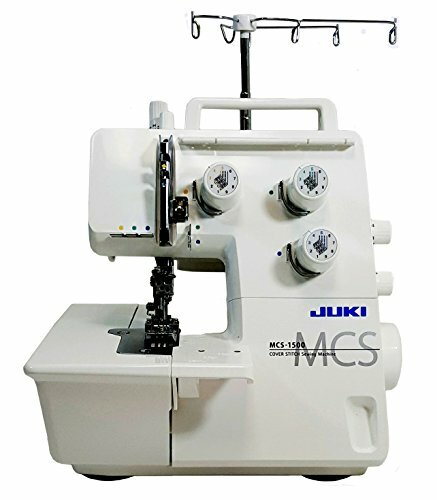 We rated the Juki MO644D Portable Serger 4.5 out of 5 stars and is a powerful household use serger that has many of the qualities of an industrial sewing machine. 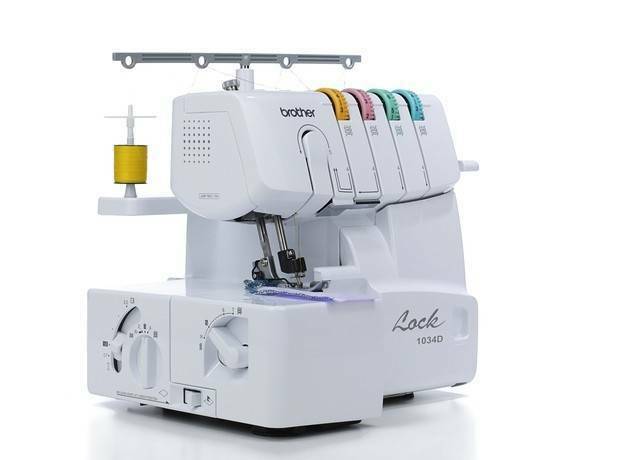 It features convertible 2-3-4 thread overlock serging in addition to having an automatic rolled-hem capability, a breakaway looper, and color-coded threading. In addition, this machine provides a differential feed and an adjustable stitch length that is very helpful whenever there are ruffles or waves in the stitching. 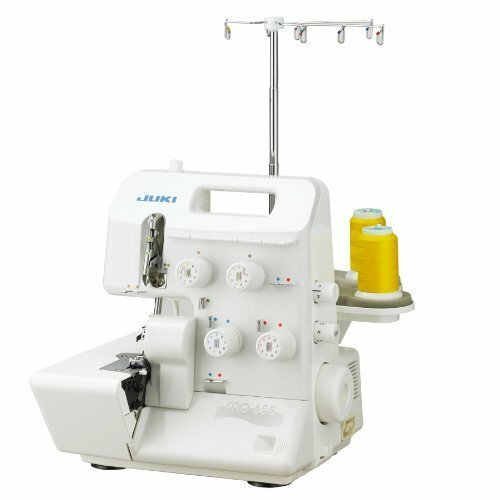 The Janome 8002D Serger is a sturdily designed compact machine. 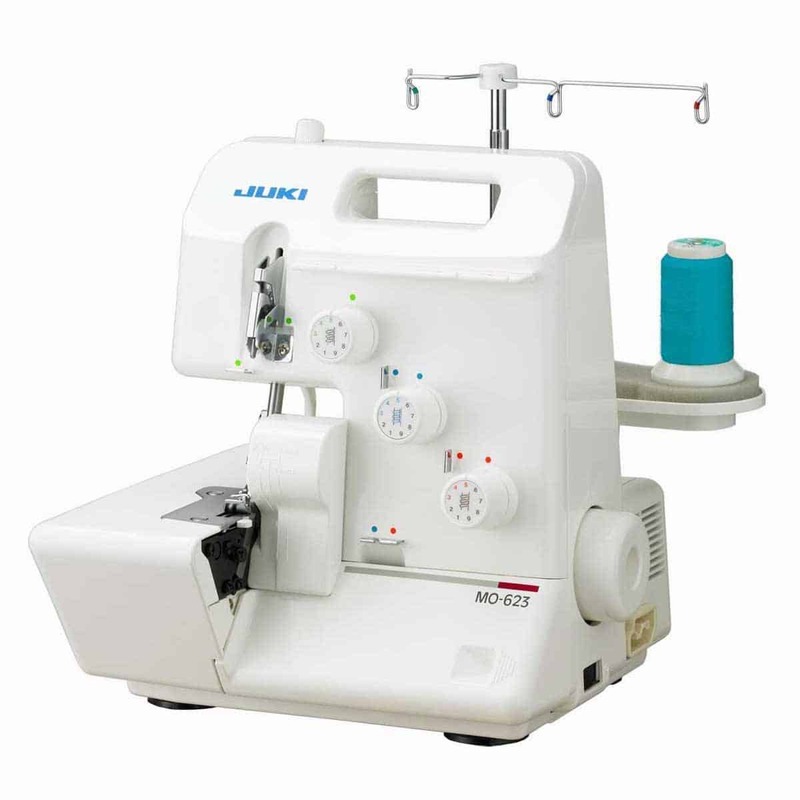 This serger features a well-defined Janome stitch mechanism that provides high quality 3 or 4-thread operation, adjustable stitch length and cutting width, and speeds up to 1,300 stitches per minute. It also features a built-in rolled hem (no plate change needed) that guarantees a professional finish. Other components of this machine are a simple-to-read color-coded threading chart, an electronic foot, whisper-quiet operation, and an extra-high presser foot lifter. Why You Should Buy It: This serger is exceptionally well designed, includes all the features that longtime sergers have been asking for, and is sturdy, well built, and versatile. We have rated the Brother 3234DT 2, 3, or 4 Thread Serger with Differential Feed 4.5 out of 5 stars and is a quality high-performance 2-3-or-4 thread serger that reliably delivers professionally edged finishing on a broad assortment of fabrics. This machine edges woven fabrics and knits, creates gathers, decorative edges, and ruffles, serges spaghetti straps and narrow sleeves, joins laces, and much more. 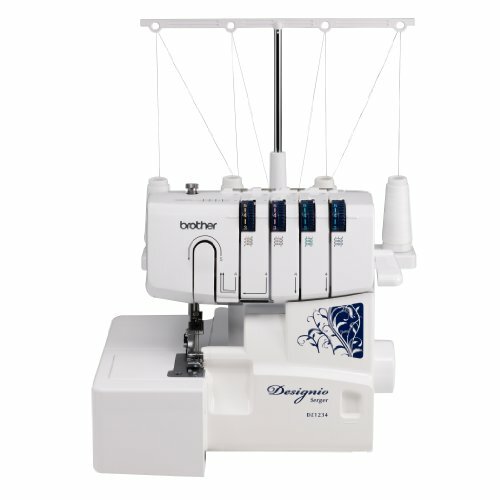 After reviewing a multitude of available sergers, our editor's choice is the Brother 1034D 3/4 Thread Serger With Differential Feed. This quality economically priced machine is the perfect choice for all types of fabric as well as home decor, and it provides a finished, commercial-grade look to all of your projects. This first-class serger is simple to thread and straightforward to use and comes with a printed manual, instruction video, numbered and color-coded lower and upper loop threading, and has a 25-year limited warranty and free phone support for life. It also comes with a foot controller, needles, a soft cover, 2 snap-on feet, and more. I appreciate your knowledge of sewing and what the various new sergers do .